1. Mow the lawn as short as possible. 2. Top the area with 12 inches of small wood chips or chipped/shredded tree limbs. In a few weeks, you should have soil suitable for planting something other than a lawn. Preferably, putting in plants that are a lot less work, are edible and/or use less water, fertilizer and pesticides. "Double digging the soil 12 inches isn't necessary," explains Chalker-Scott on her blogsite, The Garden Professors. She goes on: "Double digging the soil 12 inches destroys soils structure...Sheet mulches impede water and air movement. They're not needed to keep the grass from growing through. Wood chips do this just fine on their own. And don't worry about that initial 12 inches of chips. Within a few weeks it will settle to about 8 inches. Let it sit for several weeks. Then pull aside some of the chips and take a look. If the process is done, the grass and/or weeds will be dead and decomposing - a natural compost layer. You can then plant whatever you like. Reuse the chips somewhere else in your garden." This is not an inexpensive process, costing about $1.30 per square foot of lawn area you want to cover. For a 12-inch layer of small bark to cover 100 square feet, you would need four cubic yards of bark. In our area, that would cost you about $130, plus taxes and delivery. And that's just to cover 100 square feet! 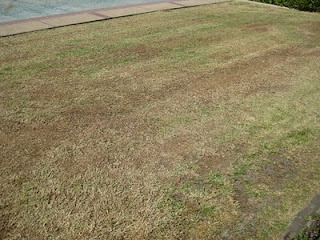 I would be inclined to leave that mulch in place for several months, if not a full year, to make sure the lawn is dead. 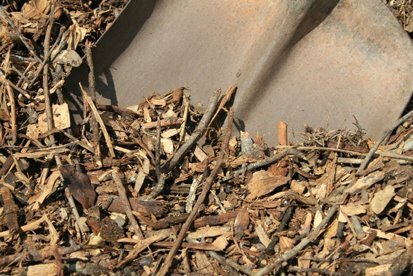 Other reasons to leave that mulch on as long as possible: those small wood chips/chipped-shredded tree limbs are slowly breaking down, feeding the soil, improving the tilth (a healthy combination of nutrient-rich soil and air pores) and increasing microbial activity in the growing zone. Plus, it isn't bad to look at, either. There is another down side to this process: 12 inches?!? That's one hell of a first step UP to your former lawn. And then your shoes get buried. Other ways to kill a lawn: soil solarization (limited to use during the summer); and, America's most popular method to kill unwanted plants: applying glyphosate (aka Roundup). But the more you read about glyphosate, using non-chemical means to rid yourself of a lawn looks better and better. No matter which lawn-killing process you use, remember Farmer Fred Rule #7: Bermudagrass is forever. Personally? I don't want to kill my lawn. But I've got some weeds that you can have. Lawn killing in progress. Chipped tree mulch is available for free from SMUD's yard on Folsom Blvd. Bring your own truck and shovel/pitchfork. Oh, and stock up on ibuprofen. We had a severe storm in my county a couple of weeks ago. My village has a "mountain range" of chipped trees which is free for anyone who wants to pick it up. I've been picking up carloads for paths between my garden beds, and other uses. I also have an area of grass that I'd like to kill, and found your post while Googling to see if I could kill grass with wood chips. So it's nice to know that 1) this will work, and 2) I can do it for free if I want to do the work of loading it in my car and bringing it home. I use two methods that have always fitted me. Herbicide application and solarization. However, i can admit some options. Thank you for the detailed explanation how you do it. It is always of interest for me. My lawn killing in process.I am using two methods you've mentioned. There is a variety of options. Thanks for the help. It is of critical importance for me too. 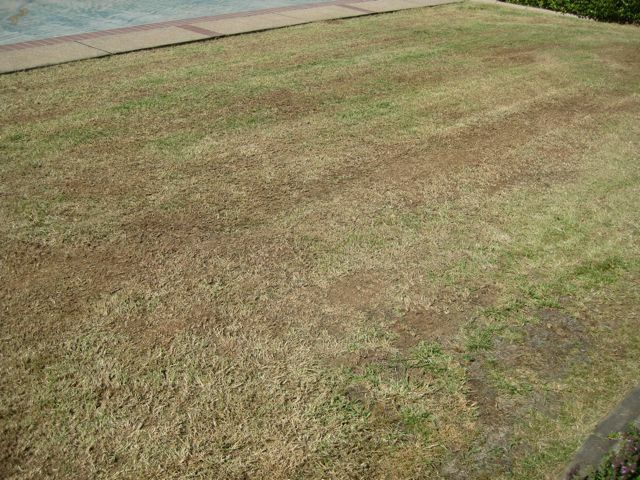 If the New Lawn grasses can cope up with the stress, it will be healthy and dense and will be able to resist disease. Sometime the disease may spread and it becomes out of any control. However, the disease resistant cultivars can be implemented to avoid future problems. Not for the faint of heart but I use a propane torch. This when used on green grass or weeds is very effective. It did not work on tuberous weeds with one application unless repeated through out the year.